Cafe-style Indian vegetarian restaurant in Wembley, just down the road from Wembley Central Station. 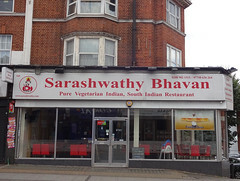 It's not entirely clear what its official name is; the frontage and menu claim "Sarashwathy Bhavan", while the bill and website claim "Sarashwathy Bavans". The corner location allows floor-to-ceiling windows on two sides, letting in plenty of light. There's seating for around 50 people at black melamine-topped tables flanked by bright red pleather chairs, and metal cups and jugs of water sit ready on each table. The floor is shiny white tiles and the walls are painted cream, unadorned aside from gold faux pillars and a couple of flatscreens. A shrine sits in one corner, next to a mirror-fronted bar, and a chandelier-style fixing hangs from the centre of the ceiling. Kake visited on a Tuesday lunchtime in August 2018. There were three other customers when I arrived around 12:30pm. No music was playing, and the flatscreens were switched off. Bhel poori (£4 on the menu, £3 on the bill) photo was disappointing. The puffed rice was either soggy or stale, and the tomatoes were pale, mushy, and flavourless. The balance of ingredients was off too — although it was quite a large portion, it contained exactly two peanuts and three pieces of potato. The flavour was reasonable; a little sweet, but with a good level of chilli. Tomato and onion uthappam (£5 on the menu, £4.25 on the bill) photo was much better. It was nicely sour, though a little lacking in structural stability in places, which made it hard to dip into the chutneys without falling apart. The top was browned and crispy, in a good way. The chutneys were fine without being outstanding, and the sambar was pretty good in both flavour and texture. Child-friendliness: They have at least three IKEA Antilop highchairs. Accessibility: A small step to get in. No steps to the toilet (which is marked as accessible but has no alarm cord and isn't very big). Last visited by Kake, August 2018. Opening hours taken from menu, August 2018. Page last edited 2018-08-07 16:38:21 (version 1).